I race the day in my Mitsubishi Mirage rental trying to make Sioux City before sundown. Using Omaha as my base, I take turns each day with the 29 and the 75 on the respective Iowa and Nebraska sides of the Missouri River, which, in this part of the country, runs northward before it starts west again in the Dakotas. Up here, many towns are already gone. Some farms and refineries seem to be going strong; others not. I frequently take exits toward the river from the freeway on a whim. Maybe it’s the cold or the time alone or the flat expanse of the plains, but I am sensitive to a particular kind of instinct seemingly absent or out of my reach in Los Angeles. Parking lots in the middle of nowhere tell me there was once a reason to be here. This house and shed might have once been a check-in area for those arriving to work or visiting. The nearby grain elevator stoically protrudes from the ruined asphalt on the other side of the tracks. Like so many other areas I find along these river roads, there are no signs of life. hiding my car from plain site, but I come into these areas somehow expecting that anyone I might worry about has already seen me arrive. Whether paranoid or justifiably careful, I often have the sense of being watched out here. Entering the house, I step carefully. The dark interior with its peeling paint, broken flooring, and debris contrasts sharply against the bright light that cuts in between broken window blinds, jagged glass, and missing doors. When I misstep, the crunch of broken tiles and ceiling panels on the floor is louder than I want, much like the crunch of feet in snow or on brown leaves when walking alone in cold places. Here it’s a thin blue sort of cold, vaporish clouds passing and dissipating with celerity, and as I take pictures, my breath fogs the viewfinder. I can’t help but think of the show Breaking Bad and consider that an area like this might be perfect for cooking meth. And then I come to a room. Its two windows are broken out. Car tires and every last ceiling panel lay scattered across the floor. In the center of the room is a twin mattress. Strewn across the mattress are women’s clothes. Multiple changes of it. A bra. My fingers and toes are starting to numb. I can’t think of a good reason that these clothes would have been left here. If she came in with them, why didn’t she come out? I exit to the outside through the doorway in the room, door itself gone. I wander around outside toward a parking structure. As with the house, I make my way around taking pictures, intentional in movement, with where I step. I keep sounds low and try to remain undistracted by my own activity. A sudden snap from nearby jolts me into an adrenalized whirl, only to see that a rabbit has leapt out of a pile of garbage and run into the woods. This is the part of the horror film, I think, where viewer and character alike, given a false start, is unwisely softened by relief just before the real threat jumps out and saws someone’s limbs off. I’m going to be pissed if life imitates B-level art here. I go ahead and walk farther past the tracks to the grain elevator and take a few more shots. I make my way back to the car. As if on cue, an old man in a pickup sits parked in his truck next to my car to have a looksie. How is it possible I didn’t hear him drive up? I wave but he doesn’t wave back. I decide to behave as if this is a normal situation and get into my car without making further effort to communicate. He watches. I drive straight out, at normal speed, and in the direction my car is already pointed. We watch each other in our rear views. He makes no attempt to start his truck or follow. Days before I headed northwest from Richmond, Indiana on my research trip, I was visiting Indiana University East for an exhibition I was honored to jury, and to lecture. Among my duties while there was to judge the exhibition and to award prizes. It was my first time to be in the curious position of imposing hierarchy on a very diverse group of artworks. On one level, direct comparisons are absurd, but on another, certain works undeniably moved me as I walked through the exhibition to see the work in person for the first time. I came to a series of cross stitch designs in frames entitled, “A Study of Domestic Violence” by Kat Douglas. At first they seemed typical of something one might find in older midwestern homes, and, in fact, she found the designs herself in antique shops throughout rural Missouri, then re-embroidered them. The designs, as far as I know, were altered only by the dates that were sewn prominently onto them by the artist herself. My eyes landed on one of the pieces in the lower left of the arrangement. It was an unfinished cross stitch or perhaps the viewer just reads it that way. A country doll with a blank face, blank feet, a blank background, all in shades of white, beige, and tan. The date reads __ __ 12. All the other dates displayed on the works throughout the overall arrangement denote when a Missouri woman was murdered by her husband or intimate partner. 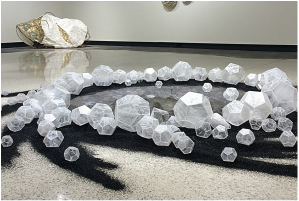 Each individual piece represented one death from all of those that she could collate from 2012. I can’t help but wonder now what she would think about the mattress and women’s clothing I would soon find near Sioux City, Iowa just a few days later. typical biases in the U.S. is the coastal tendency to overlook and undervalue what goes on in small-town and rural America. I would argue that this persistent dismissal and oversight negatively affects the feelings and sentiments those in smaller towns have of themselves and of those on the coasts. Right wing nuts like Tomi Lahren, who mobilizes gullible conservatives for Trump throughout the country, and who grew up in South Dakota, just a stone’s throw from where I found the mattress, emerges, I would argue, from the angry and resentful landscape that contributed to bringing the current president into power. This isn’t just conjecture; she said as much herself during her recent guest appearance on the Daily Show with Trevor Noah, revealing an underlying anguish, conscious or not, accompanying a kind of fear of obsolescence that foments into the terrifying rage and hostility that has become her hallmark and that of her alt-right contemporaries. Kat Douglas refers to her cross stitches as “empathic memorials.” Thinking of this while watching Tomi Lahren sputter in often self-contradicting outrage evidently stemming from some private anguish across the table from a far more calm and eloquent Trevor Noah, I wonder how she might have benefitted at a younger age from someone like Douglas. Might her capacity for compassionate and abstract thought have helped Lahren more constructively vent her pain and find a way out of the psychic cul-de-sac of cheap branding and damaging attention she today is imprisoned by? I wonder about the possibility of a country where artists, pushed out of the cities by high prices, return to the many towns and cities they emigrated from to contribute to their local cultures in positive ways. I fantasize about a post-Trump government program that gives grants to artists to do just that as one among many methods aimed at repairing the social and economic damage currently being done and which still awaits us. thousands of them on a marshy field babbling on and on about god knows what. I am soon aware that I’m the only witness to this, and feel a sense of gratitude toward, I suppose, the planet for continuing, in spite of us, to remain itself. Decomposition. Insulation somehow growing out of walls of what might have once been an auto repair shop. Frozen skeletons of livestock. The hair on the snout of a calf skull still intact. The entire facade of a house cleanly removed and left that way as if a life-sized doll house. An interior door in plain view is marked with western font, “cowboy”. You could put on a play here. The set comes prefabricated. Eventually I find even an abandoned museum of antique farm equipment. All around it are antiquated vehicles and tools for farming that I’m ignorant of, having no agricultural education other than coming up with names for piglets and breaking the necks of chickens on my grandpa’s Missouri farm as a kid. State park information centers. Replica Mandan earth lodges. Replica forts. Replica riverboats. ​And all the while, the space between them, spent in the Mitsubishi with right wing radio, Christian radio, NPR when in range, Crosby, Stills, and Nash, Elton John, and our very own dictator railing against everyone from Muslim immigrants to the Prime Minister of Australia. 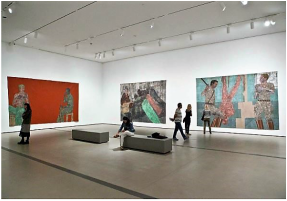 Upstairs, the Joslyn Art Museum in Omaha has on permanent display historical artwork of and by indigenous cultures that once flourished near the Upper Missouri. Portraits of important tribal members with names such as L’letan and Big Elk acting as emissaries to the United States government were painted by Charles Bird King, Henry Inman, and Alfred Jacob Miller. Several watercolors and aquatints of Native American life by Karl Bodmer exhibit throughout. The painting “The Trapper’s Bride” (1850) by Miller leapt out at me since it had been among the historical paintings I researched for past work. This is my first time seeing it in life. 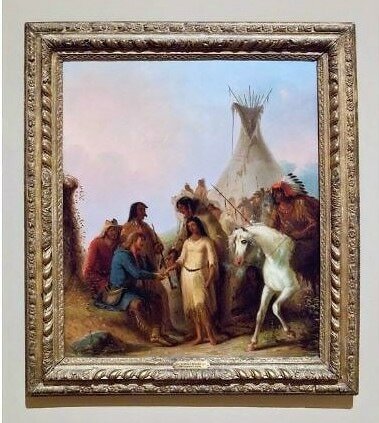 It depicts a white trapper purchasing a native wife from her father. This very history, in fact, exists in my own family lineage. Throughout Nebraska, Iowa, and the Dakotas are a number of present-day reservations. The recent and probably forthcoming Standing Rock protests happened and will happen near Cannon Ball, North Dakota. 66. Sunoco, who would operate the pipeline, has so far caused 203 leaks and spills operating other pipelines, which, according to Wikipedia, actually makes them one of the worst operators on record. Loans from a list of banks too long to enumerate from around the world include Citibank and Wells Fargo. ​In short, a lot of rich people stand to get richer, and, in fact, now need to in order to satisfy the expectations of their numerous investors. Mein Führer has already signed an executive order to advance the construction of the pipeline. I wonder what artifacts pertaining to present-day Upper Missouri indigenous life any of these corporations or investors might like to acquire for posterity. I wonder if Cliff Baxter, former Chief Strategic Officer for Enron ever knew about or enjoyed the artwork here. I like to imagine a painting hanging in Baxter’s office at Enron. 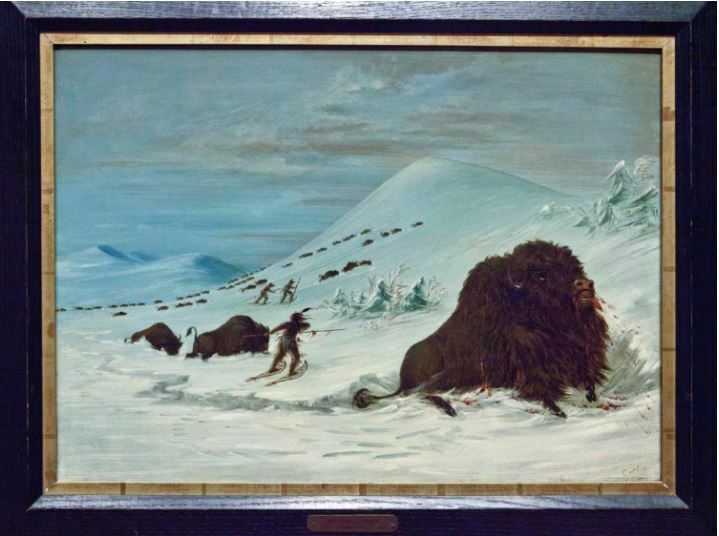 I like to imagine the oil “Buffalo Hunt in Snow Shoes” by George Catlin, depicting a dying buffalo impaled and bleeding out all over the white snow, on the wall behind his thousand-dollar swivel chair. Then I like to imagine Baxter turning slowly to stare at it, his plans for suicide growing stronger ahead of his congressional hearing. Then, at the end, when he’s alone in his car writing his cliché of a suicide letter to his wife and kids, I like to imagine the bloody buffalo flashing into his mind just before he blows his brains out. I like to imagine it because I like to imagine that somehow someday I’ll be looking at a Catlin or Remington and thinking, I remember seeing pictures of this hanging in the Oval Office in the days before Melania Trump slit the throat of her sleeping misogynist husband. Now that’s a painting I’d save up for. abandoned locomotive assembly plant. I know exactly where a segment of cut-out chainlink fencing is because I was standing there eyeing it last time when the squad car drove up. I’m a white male, so the cop simply warned me against it and drove away, rather than throw me on the ground and beat me half to death. That warning had come on my first day out along the Missouri. Now it’s my final day, before I head back to Cincinnati to return the car and get my flight out. Everything in this area exists in a state of neglect. Whatever infrastructure was here has since eroded completely. I slip through the hole in the fence without delay or incident. I creep up a fairly easy incline and pull myself up a ledge. As soon as I get my knees up under me, I look down into a cavernous industrial expanse unlike any I’ve ever seen. Rays of light burst in through holes in aluminum siding, segments of crumbled wall and areas of missing roof. Puddles the size of small ponds lay on the ground, some frozen with embedded leaves and debris. About 1,400 years ago, hundreds of what are known as the Cahokia Mounds were built here by a lost Mississippian culture. The parts that weren’t destroyed in development have been preserved by the State of Illinois and is designated a World Heritage Site by Unesco. 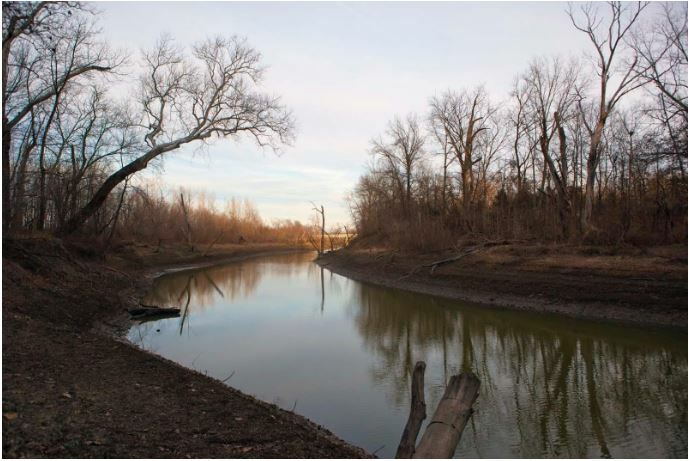 If any remained on the Missouri side of the Mississippi River, they would extend directly into Ferguson. In its day, it was the largest civilization north of Mexico, and mostly failed ostensibly because of deforestation and depletion of resources long before contact with Europeans. I know all of this because, after I leave here, it will be my next and last stop. I will climb Monk’s Mound, the largest one, the one the king lived on top of, peer at the confluence of the Mississippi and Missouri Rivers, into the post-apocalyptic zones of East St. Louis, Ferguson, and Riverview, and know that each morning, when the king woke, he gazed out to where I trespass now. I try to stay as quiet as possible, avoiding crunchy looking areas, as I take my time getting around in the dark recesses and stairwells. It’s far colder than outside. My breath blooms in front of me and my fingers and toes smart even in gloves and thick socks. I consider that, like the little abandoned house near the grain elevator in Nebraska, there could be someone occupying the space, even if it is this cold. I test stairs before I put my weight on them. And there are areas, particularly near precipices, of flooring that I don’t trust to step on. The stairs take me up several stories, every new floor a revelation. I come to a large ring, appearing like a portal, or as my friend Andrew recently observed, like a Stargate. I imagine how crazy the hipsters of LA would go for a space like this. The first thing they’d do is turn it into a bar with an area for yoga. Everything changes. There’s nothing that can’t be colonized. 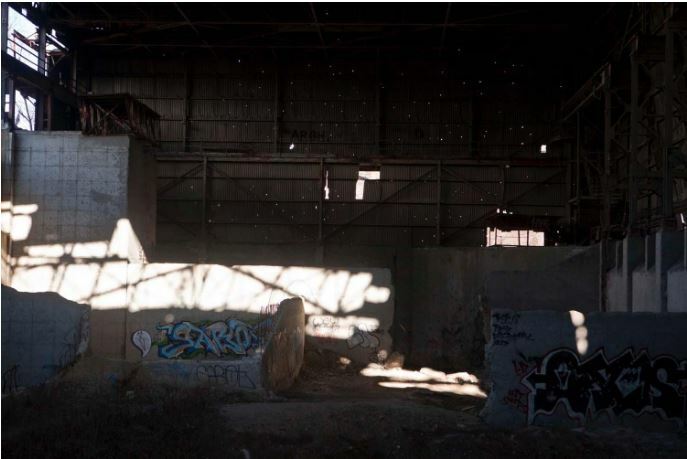 ​It’s only after I return home to L.A. that I’ll figure out that this is probably an assembly plant, researching the history of Ferguson through a process of elimination and comparing it to photos of abandoned plants in Russia and Detroit that I found online. I’ll soon learn that Ferguson had a boom at the turn of the 20th century and built the first locomotives and railways to connect St. Louis and make it the “Gateway to the West.” The 60’s and 70’s saw a slow in demand and decline in manufacturing. Economy and infrastructure failed by the 80’s. By the time Michael Brown was murdered by police in 2014, two out of three citizens of Ferguson had active arrest warrants. The revolt that occurred afterward was the revolt of an apartheid police state. I spend about an hour total here. If it were warmer, or I wasn’t afraid of getting caught, or had more storage left on my memory card, I’d want to stay here all day. I’d come here regularly to think an idea through or simply to read or draw. It is almost a place of worship. All that is heard is an occasional twist of metal as a breeze comes through, and silence otherwise. What makes a space sacred is perhaps nothing more than the privilege of being alone with its history. background like stars in a night sky. All these stars made by bullet holes and the sunlight from the other side pushing through. I think of Leonard Cohen singing that line from that one song, “there is a crack in everything; that’s how the light gets in.” Reflecting on it now, I picture Cliff Baxter, Chief Strategic Officer, on a discarded plastic lawn chair in front of the wall with a revolver under his chin pulling the trigger over and over again, wanting to end it each time, and each time the endless bullets passing like wind through his phantom head and sent upward through the wall behind him. He just can’t seem to get the job done, Cliff can’t, and neither does he seem to run out of ammo. I imagine this is how eternity is spent for all the corporate robber barons the earth has ever seen, that justice is served somehow, and what we among the living see as stars, scattered there on a dark wall, is the accidental art that their death drives have left us with. Someday, we’ll collect it all, and gift it to the museums of the future. We’ll hoist toddlers on our shoulders and we’ll point at the art on the wall and we’ll say, behold, toddler, proof of a time before this one, when men were lost in the dark, and destined to repeat their crimes. ​​Outside, my eyes adjust to the light. I duck through the opening in the fence and make my way across the street, no one the wiser. I start the car and head to the mounds to learn something new about how civilizations die and to marvel at what they leave behind.